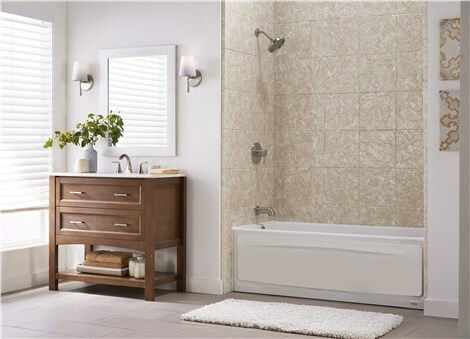 If your home is outfitted with modern bathroom features, like those offered by Tiger Bath, consider yourself lucky. Today, many new homes and remodeled bathrooms are equipped with state-of-the-art bath fixtures and wall surrounds engineered to look new for years,with minimal tub scrubbing and shower maintenance.If your bathroom is comprised of outdated products and materials, though, it's going to be harder to keep your space looking good. So, how do you keep your space from looking old and worn out? At Tiger Bath, we’re experts in shower and bath maintenance—be it an older model or a newer, advanced one. We’ve found that when it comes to maintaining older bath products, keeping them looking new usually comes down to three important steps: prevention, reparation, and replacement. In this article, we’ll go over each of these three steps in detail, so that you can keep your shower or tub area looking sparkling clean and new. An older, but well-maintained shower or bathtub can look just as clean and brand-new as a bath fixture you would find in a recently renovated bathroom. Along the same lines, a poorly maintained bathtub or shower will quickly start to look old and scummy, even if it’s relatively new.If you’re not giving your bathroom the attention it needs to sparkle and shine, it’s not going to. DON’T allow hard water build-up. Take care of it before it causes permanent, irreversible damage. DO wipe away residual water droplets soon after a bath or shower, so they don’t stain your walls. DO use shower cleaning spray when you wipe down your stall after use. DON’T let bar soap scum accumulate. Make sure to remove your bar soap from the tub or shower after use, and thoroughly clean the areas where soap residue has formed. DO try to switch from bar soap to liquid soap for easier bath maintenance. Give your bathroom the repairs it needs, as soon as issues come up. It’s all-too-common for homeowners to put off making repairs, which can make things worse in the long run. You might be able to live with cracked tiles or broken grout for a bit, but the mold that’s building up behind your wall tiles will become a problem that’s harder to fix as time goes on.Keeping up with repairs is necessary for proper tub and shower maintenance and will help keep your shower and bath looking clean. Even if your bathroom has passed the point of no return, you may still be sinking money into repairs and maintenance because it seems more cost-effective than replacing your fixtures or investing in a full bathroom overhaul. If you're currently in this scenario, you have to be honest about whether this is a tenable strategy for your household, or if your best bet is to replace your current bath fixture with a brand-new tub or shower replacement. If you’re interested in installing a new, gleaming shower, replacement bathtub, new wall surrounds, a sleek shower enclosure, or smaller bath accessories and design accents, contact Tiger Bath today! Our friendly customer service representatives are ready to speak with you about our affordable, superior bath products and installation services, so pick up the phone and give us a call now!We also invite you to submit our easy online form to request a free project quote.